The Windows 10 Fall Creators Update is coming soon to right some wrongs. Revealed Thursday at the company’s Build conference in Seattle, the next major version of the operating system fills in some of the missing pieces we lamented in March’s Creators Update, and it makes it easier to work across multiple Windows devices. As the name suggests, Microsoft will ship the OS upgrade “late this year.” Company executives declined to commit to a specific date, though Microsoft said recently that it will ship Windows upgrades in March and September. As a footnote, Microsoft also revealed that 300 million people use Windows 10 daily, a different usage metric to consider next to the 500 million Windows 10 devices the company revealed previously. OneDrive Files on Demand, which apparently (and finally) bridges the gap between storing large files on OneDrive, yet being able to access them when you want. Microsoft will also announce Story Remix, an app designed to automatically combine photos and videos together with a soundtrack, theme, and cinematic transitions, the company said. Finally, Microsoft will add SuSE Linux and Fedora Linux as part of the Windows Linux subsystem, available via the Windows Store. All the new features will be presented with a subtle interface change known as the Fluent Design System, previously called Project Neon. The Microsoft and Windows 10 logos are seen on the company’s booth at Mobile World Congress in Barcelona on February 24, 2016. Microsoft will reveal more details about the new features during the keynote, but we can make some educated guesses. With Timeline, you can jump back in time into files, apps and sites, using a visual timeline to help you navigate. Timeline was described as an expansion of Task View, but it sounds like much more. With “pick up where you left off," if you’re in, say, Word on your desktop, you should be able to pick up your (Android or iOS) phone and immediately continue editing. Microsoft has also previously promised a scenario where Edge webpages would become instantly available on other devices. It’s unclear how useful Clipboard will be, though it sounds like it has potential as a quick-and-dirty file transfer protocol from one device to another. Uploading a file to OneDrive and then downloading it again can be an unnecessary hassle. With Clipboard, you can take a photo, map link, paragraph, even an animated GIF and then paste it on the other device—whether it be a phone or your PC. Windows 10's Fall Creators Update will include OneDrive Files on Demand, which will makeOneDrive files accessible on any device as if they were local files. 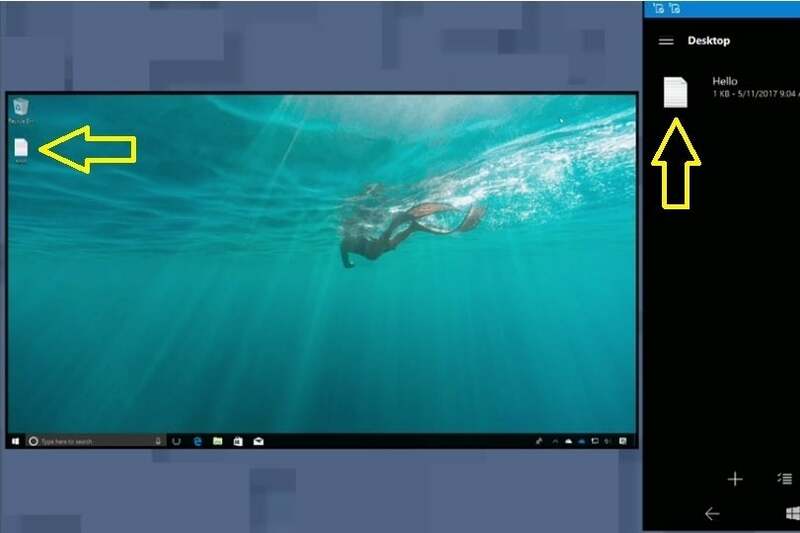 This demonstration shows the same file available on a Surface Book and a Windows Phone. OneDrive Files on Demand, meanwhile, will eliminate the gap between files stored on your PC and files stored on OneDrive. The so-called online files from OneDrive will show up in the Windows file picker, alongside apps that are stored locally. If you’re connected, clicking them will automatically download and open them, just like a local file. If you want, you can assign a file to be stored locally. You can also save entire folders on Android and iOS for offline access. Microsoft's Joe Belfiore demonstrated the feature by creating a file on a Surface Book, then showing how it could be accessed immediately on the person's Windows phone. Microsoft executives added that Windows will try to download some files proactively behind the scenes. Intelligence built into the OS will guess which files you might want to access next—photos in proximity to another you’re editing, for example. 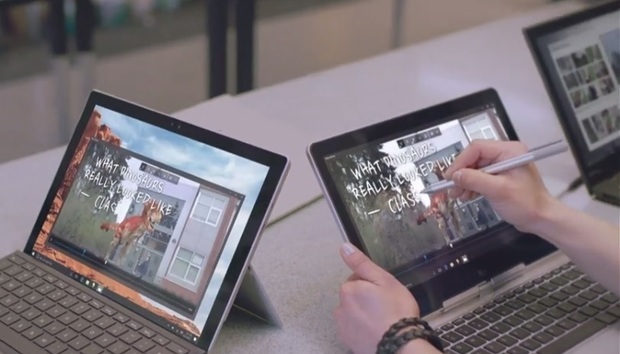 Users can collaborate on the same image in Windows 10's Story Remix app. Story Remix, meanwhile, sounds like what Google already does with its Google Photos Assistant, stitching together photos into a slideshow, sometimes combining them with video. 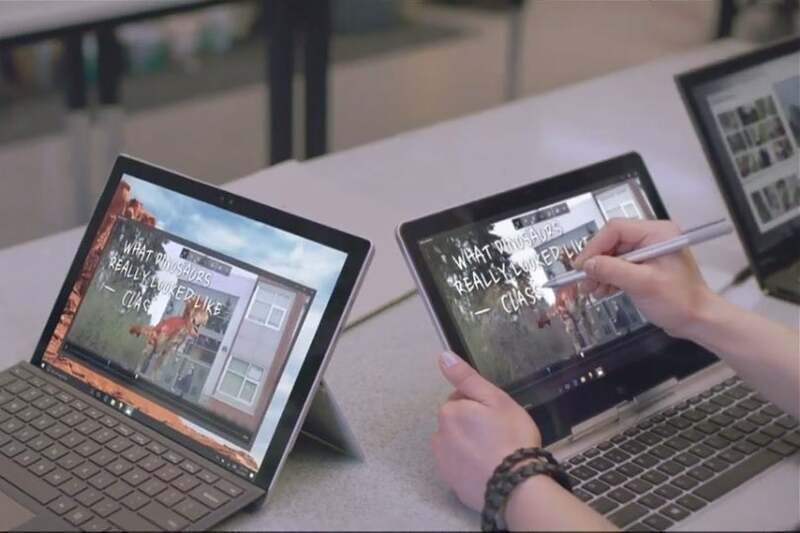 Microsoft, however, appears to want to one-up Photos by allowing users to add 3D objects and Windows Ink to the collection. If you’re expecting Microsoft’s new Project Neon or Fluent Design to be a grand remaking of the Windows interface, you’ll be disappointed—Microsoft’s words, not ours. Microsoft executives described it as a more gradual journey over time. Notice how the background peeps through the Start Menu: Fluent Design’s influence. You can already see some very basic elements of Fluent Design in both the Windows 10 Creators Update as well as the more recent builds: the Aero-like transparency effects in the Start Menu, for instance. Look for similar transparencies in other apps over time. According to Microsoft, though, utility, not aesthetics, will rule the Fall Creators Update. Expect the operating system to evolve as Microsoft continues to roll out Windows Insider builds until the eventual launch.